With all the rumours piling on a rumoured death of a senior politician (let's admit it, the rumoured figure is Lee Kwan Yew) in Singapore, former Presidential hopeful Mr Tan Kin Lian posted a Facebook post that resulted in several netizens condemn. But it turned out Mr Lee Kwan Yew is actually fit and healthy! What a great news! He was spotted walking out of SGH and looked okay. A rumor was circulating yesterday that a well known personality in Singapore, who is somewhat respected and generally feared, had passed away. That rumor turned out to be false. I recall a story told by a Swedish friend. In a speech 20 years ago, he said, "During the dark days of the second world war, Norway was occupied by the German Nazis. Every few days, there was a rumor that the Allies had landed and that Norway would be liberated. It turned out to be another false rumor. After a while, the people became skeptical of these rumors, but felt that it was nice to hear them anyway! " Ha, ha!. Happy 47th National Day! Dawn, you asked about "diverse views". Let me explain in this way. You have certain views about what is right and wrong. I have my own views that are different from you. You have to accept them as "diverse views". You do not demand to have an explanation and do not argue over their views that their views are wrong. Their views are only different from yours. You have certain views about what is right and wrong. Other people have their own views that are different from you. You have to accept them as "diverse views". You do not demand to have an explanation and do not pass judgement that their views are wrong. Their views are only different from yours. 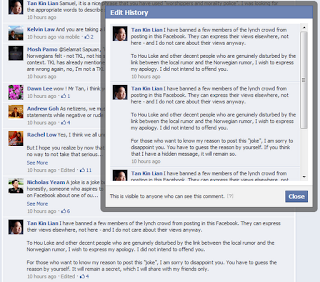 I have banned a few members of the lynch crowd from posting in this Facebook. They can express their views elsewhere, not here - and I do not care about their views anyway. To Hou Loke and other decent people who are genuinely disturbed by the link between the local rumor and the Norwegian rumor, I wish to express my apology. I did not intend to offend you. For those who want to know my reason to post this "joke", I am sorry to disappoint you. You have to guess the reason by yourself. If you think that I have a hidden message, it will remain so. For those who want to know my reason to post this "joke", I am sorry to disappoint you. You have to guess the reason by yourself. It will remain a secret, which I will share with my friends only. I am lucky that I belong to a crowd of 2 million who didn't vote for Tan Kin Lian. 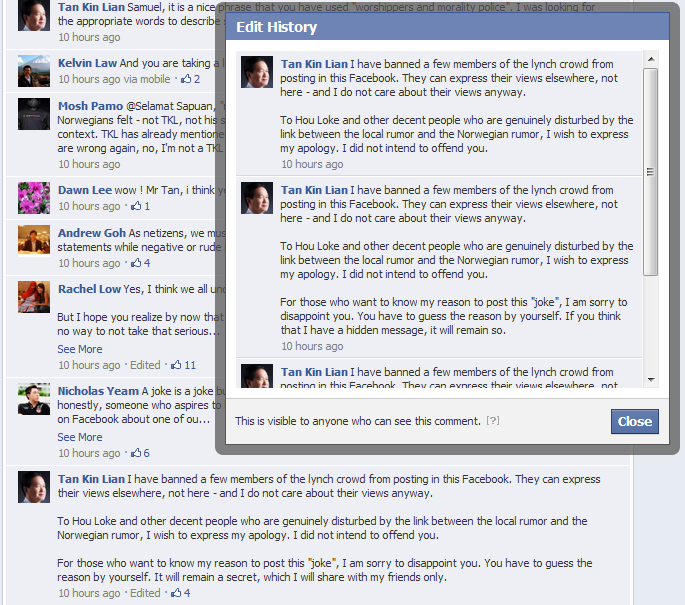 To Kerine Chen, Diana Liew and many other people who were glad that you did not vote for me. You belong to a crowd of 2 million people, so there is no need for you to advertise your decision here. Failed to become President of Singapore: PHEW! "Dawn, you asked about "diverse views". Let me explain in this way. You have certain views about what is right and wrong. Other people have their own views that are different from you (sic). You have to accept them as "diverse views". You do not demand to have an explanation and do not pass judgement that their views are wrong. Their views are only different from yours." 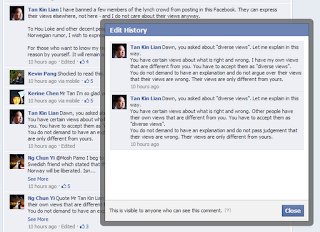 Unfortunately, this itself is passing judgement on a view that is different from yours, Mr Tan. Besides, "diverse views" really should not function as an 'immunity idol' that allows anyone to say whatever they like, no matter how immoral, blasphemous, sacrilegious, sinister or subversive. I am not advocating an absolute morality, nor am I going into the complexities of deriving a stable sense of justice and morality from pluralistic paradigms. At least not here. I am saying we can't say any bloody thing we want and then run from the consequences by claiming "diverse views". There is something wrong and very dangerous here if this meme were allowed free rein. 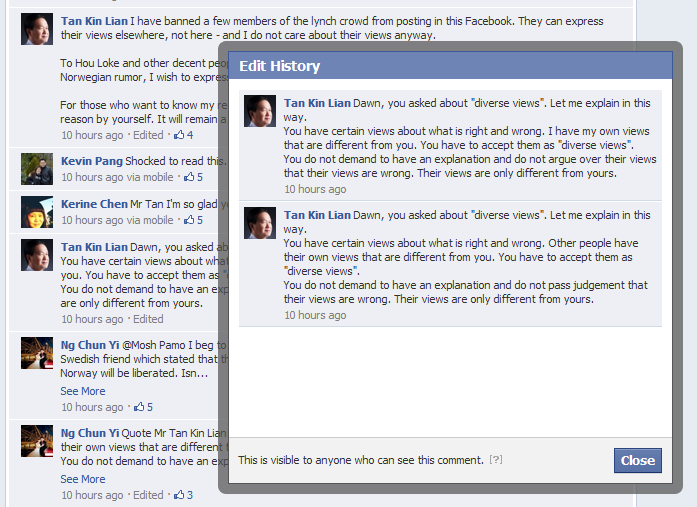 My opinion is that some opinions can be wrong, and I shall say that that Mr Tan's opinions on diverse views are wrong. But from Mr Tan's view, even if he disagrees with me, he has to accept my view as a different view on diverse views without passing judgement.